This story is part of True/False Conversations, a series of in-depth interviews with the filmmakers of this year's True/False Film Fest. 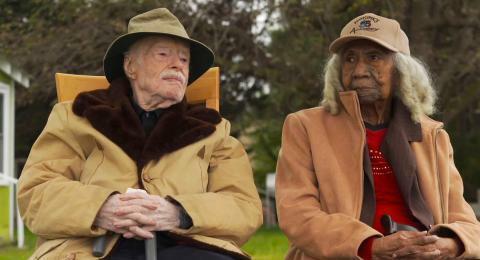 Edith + Eddie tells the love story of America’s oldest interracial newlyweds. Edith, 96, and Eddie, 95, are avid dancers and pillars in their community church. But their love is threatened when when a family feud causes Edith to be put under the control of a court appointed guardian. Laura Checkoway’s short film follows this couple as they fight for their relationship and right to make their own decisions. Claire Banderas spoke with director, editor and producer Checkoway about her film. Banderas: How did you came across this story and decide to make a film about it? Checkoway: A photo of Edith and Eddie had gone viral because they were being called America's oldest interracial newlyweds and a friend actually texted me a picture of them that she thought that I would just appreciate and my heart like lept out of my chest. In the beginning I thought it was a sweet love story about this couple who had been reawakened by each other and you know they met each other late in life and they had a spark. I thought it was going to be a beautiful story of love but then it pretty quickly took a really dark turn. Banderas: Tell me what that was like when you have these expectations of what you're project is going to be then all of a sudden all this unexpected things start happening. Checkoway: That's part of the adventure of documentary is you set out to make one story and often you end up with another. Being there and witnessing Edith taken out of her home against her will and her rights I had a sense that something awful was going on there but I didn't know the magnitude of it. I really want this film to help open a conversation about the not only about honoring elders and elder rights and elder abuse but also specifically about the flaws of the legal guardianship system. Checkoway: I don't appear in my films at all and you don't hear my voice but I think my heart bleeds through all the work and it was bleeding heavily on this one. Even in if the filmmaker themselves doesn't have a physical or audible presence that the lens is still conveying that.